Can we do similar stuff in C#? Suppose in the snippet above we want to extract out the computation logic in a separate function. A quick way will be to extract it out to separate private function. But that will be bit confusing, because the scope of the private method will not be restricted to the method Calculate and it will be a class level method. So someone reading the code later, will have difficulty to understand, that my intent was to have this private method only to be used by the Calculate method. One way of doing this will be to define an anonymous method within the Calculate method. 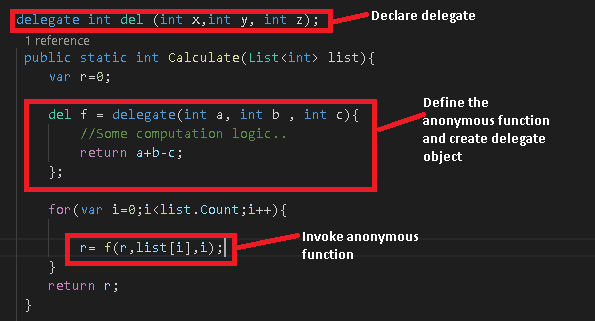 But here I have to define a delegate (type definition) and create a delegate object (first class object in itself) to cater to my simple need of having just a helper function. 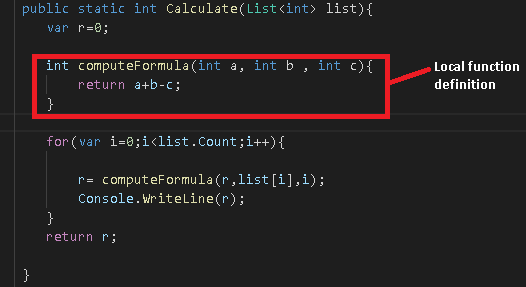 C#7.0 helps us to achieve this with the feature of local functions , another syntactic sugar coat and added compile time checks. The code below shows how we can define nested local function within another method in C#7.0. This local function gets compiled into a compiler generated private method as shown below, without adding any added overhead. In my earlier blog post related to Tuples, I had used the following two ways for accessing the elements of the tuple. This is referred to as the deconstruction of the tuple. This technique of deconstruction can be now applied to any . NET class/struct , by implementing the Deconstruct method. The code shown above is nothing but the syntactic sugar coat. 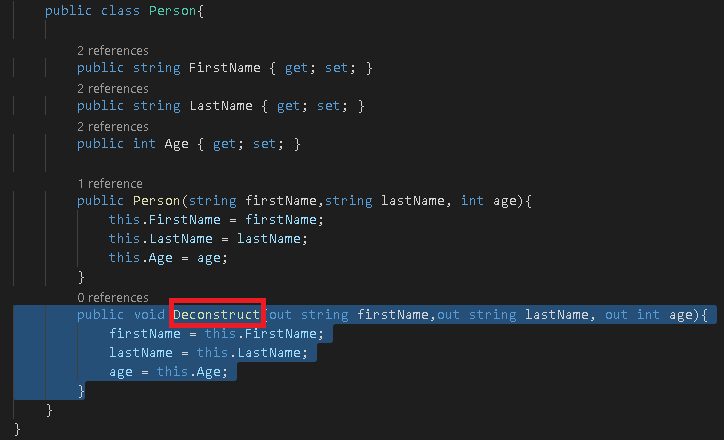 The decompiled code clearly shows the Deconstruct method of the Person class getting invoked and the variables a , b & c does not exists in the complied code. These are replaced by variables declared with names same as the parameters of the Deconstruct method implementation. What is a tuple ? - A tuple is an ordered group of elements. Tuple has been there as a data type in most of the functional programming languages like Lisp , Haskell since their inception. For example in Haskell , tuple provides a mechanism to store multiple values together. One key difference with a List is, tuple allows to store multiple values of different data type. In C#4.0, Generic Tuple class(es) was introduced, the primary intent was to make it interoperable with languages like Python / F#. This also provided an easy way to return multiple values from a method without defining a separate class or structure. We will not be able to modify the element values as these Item properties are read-only making the tuples immutable. There are about 8 overloads of Tuple.Create method and 8 Tuple classes allowing us to tuples up to 8 elements. So far so good , but if I compare the C# snippet with it is Haskell counterpart it looks cumbersome. It looks kludgy , as if some feature has been artificially dumped into the language. This is further improved in C#7 with elegant syntactic sugar coat and the System.ValueTuple structure doing the work in background. This feature is now built into the framework (4.7) and if you are using 4.6.2 or earlier, the package reference to System.ValueTuple needs to be added. Like me , if you are using Visual Studio Code you just need to run the command “dotnet add package "System.ValueTuple" from the Terminal, followed by a “dotnet restore”. We can further improve this by leveraging the new feature of providing tuple element names. These element names are used while accessing the values, making the code more readable. Unlike Tuple classes , the ValueTuple structure is mutable and it allows us to modify the values. The decompiled ( by dotPeek) shows how ValueTuple structure is doing it’s job. The code below looks quite similar to what we did earlier with Tuple class. The named tuple elements are implemented using the attribute System.Runtime.CompilerServices.TupleElementNames. TupleElementNames stores the element names as a string array.